Would your kids read Dr. Seuss? Would they read him with a Moose? Would they read with mom and dad? Would they read him on an iPad? If your kids are big fans of Dr. Seuss (and, really, who isn’t?) then Oceanhouse Media has a big surprise for you! Just this week, they have launched a brand new collection of classic Dr.Seuss stories for the iPad. ‘Dr.Seuss Short Stories’ brings together 8 of Seuss’ most popular stories into one cohesive collection that is perfect for kids of all ages. Oceanhouse has extended several special features that are available only in this particular app. These special features include professional narration, background audio and enlarged original artwork for each scene. In an effort to promote literacy skills in young children, the app also includes a word-highlighting feature that lights up each individual word as the story is read. When pictures are touched that corresponds with any give word in the story, the word zooms forward and enlarges to emphasize picture-word correlation as well. Pages even pan an zoom to accentuate Dr.Seuss’ beautiful artwork. Read to Me– Children can listen to the narrated story with words that highlight as they are read. Read it Myself- Allows children to read the books in their traditional form with no narration or sound. 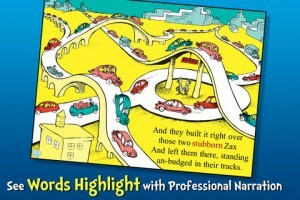 Auto-play- Stories play out like a movie for younger children who may not be able to follow along with narration. 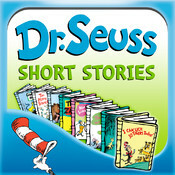 The ‘Dr.Seuss Short Stories’ app is available for download via the Apple iTunes App Store button below for $7.99.